They are maintenance-free and characterized by optimum reliability. Conformity to standards ensures maximum long-term viability, meaning that systems can be cost-effectively extended whenever necessary. Plus, these switches and routers enable future-oriented solutions in the transport sector. Despite the inherent space restrictions of trains, subways and buses, these vehicles can be networked with adaptable OCTOPUS devices to enable greater passenger safety and convenience. Examples include Internet access, information displays, passenger counting systems and the connection of PoE-powered IP cameras. The OpenOCTOPUS online configurator permits rapid selection of the ideal OCTOPUS switch for your individual application, while ensuring an optimum price-performance ratio. Modular hardware and software, with switching or routing functionality, allows for a future-proof network design and the best possible investment protection for long-term use. 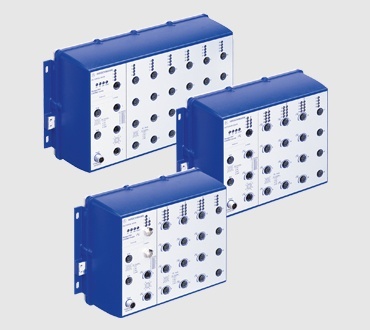 Robust compact housing - Specially designed for use at the field level with automation networks, the managed switches and routers in the OCTOPUS family ensure the highest industrial protection ratings (IP67/IP65) regarding mechanical stress, humidity, dirt, dust, shock and vibrations. They are also capable of withstanding heat and cold, while fulfilling the strictest fire prevention requirements. Extended Feature Range - The managed OCTOPUS family includes switches from 8 to 28 ports. Gigabit versions are also available that, just like the Fast Ethernet models, feature vibration-resistant M12 connectors for twisted pair cables or fiber-optic ports according to IEC 63076-3-106 v1/v4. Full-featured Industrial HiVision Management Software is available. Configurable - The online configurator permits rapid selection of the switch that best suits your individual application scenario. Over 100 water- and dust-resistant versions offer an optimum solution and maximum flexibility for a variety of application scenarios. Power over Ethernet - Versions with PoE/PoE+ support allow these devices to be powered via a data cable, meaning no special PoE-power-supplies and no additional power cables are needed. Construction - The rugged design of the OCTOPUS switches are ideal for installing directly on machinery, outside of control cabinets and distribution boxes. Supported Software - The software comes in Basic, Advanced and Professional versions and provides management, diagnostic and filtering features as well as seamless redundancy methods and security mechanisms of varying degrees. Approved for Transportation Use - The managed OCTOPUS switches and routers meet application-specific regulations for use in railway vehicles, along railway lines, for fire protection in trains and in road vehicles. Download the white paper "The Train Ethernet Backbone" and learn three challenges for rail operators and how they can be overcome through the use of Hirschmann products.